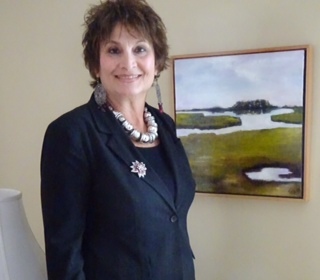 Dianne standing happily alongside the beautiful painting by Jeannette Lazarus. A 576 piece jigsaw puzzle of this original painting was created and pieces were raffled off to determine the winner. The puzzle itself will be reassembled and hung in our new library as a reminder of how important a part fundraising plays in the life of the library. "Thank you all so very much for participating in this fundraising venture! The painting raffle and silent auction of book paintings held at our November 14th, 2014 Wine Tasting event raised well over three thousand dollars for the Building Fund of the Salisbury Public Library! It was great fun and quite an adventure. I am sincerely grateful for your enthusiasm and generosity."